Previously known as ADSK Solutions, NOAR Technologies is an industry leader in sale, training, consulting, and support of 3D Laser Scanners, Drones, and Autodesk software. Located in the Detroit Metro area, in just over 7 years NOAR Technologies has become the fourth fastest growing reseller of Autodesk VAR in North America. 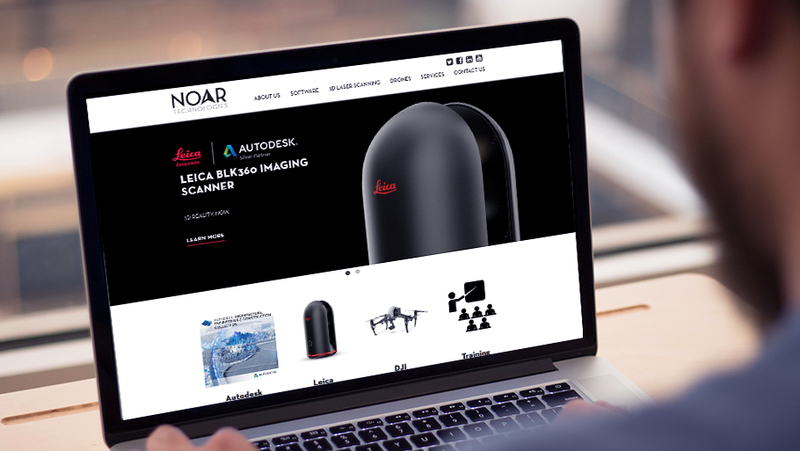 NOAR Technologies wanted their website to reflect their new brand name and image, a change from the crowded and unengaging ADSK Solutions site. NOAR partnered with Media Genesis for a fresh, clean site with large hero images that would captivate their visitors and relay their information in a professional and engaging way. We began our relationship with NOAR Technologies by gaining a thorough understanding of their rebranding efforts and what that signified for the company. After benchmarking NOAR against competitors in the industry, our design team created two modern layouts for the new homepage. After the NOAR team chose a final homepage design, subsequent internal pages were formatted and designed in the same style. Our development team built the website using the WordPress Content Management System (CMS) and added custom features such as dropdown image banners for the main navigation and a video section on the homepage that pulls videos from NOAR’s YouTube page. The website is also able to show specific FAQ sections at the bottom of interior pages and gives the editor the option to change the font color and alignment on the homepage banner to complement the image being used. The final result was a sleek and informative website that showcases NOAR’s products, services, and accomplishments.